One of the biggest problems about being gluten intolerant or Celiac is the inability to eat out safely. While many places are becoming more aware and offering some GF options, the risk for cross-contamination is always looming. 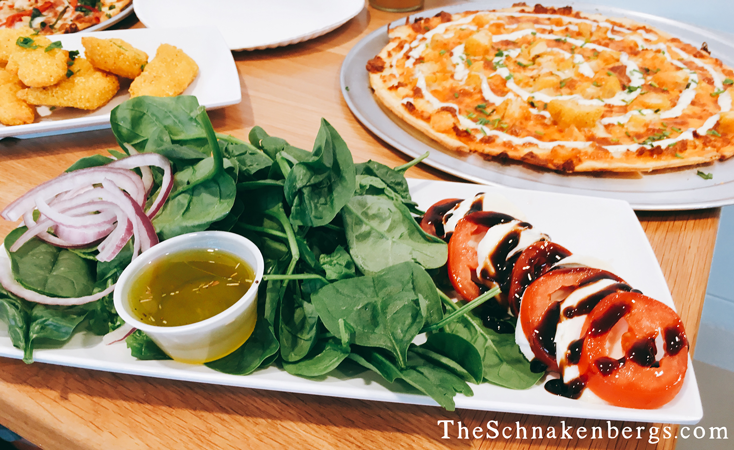 While we’re occasionally blessed to find completely gluten-free restaurants, the next best thing is a place that takes their prep space very seriously and truly understands the concerns of someone with food allergies of any type. 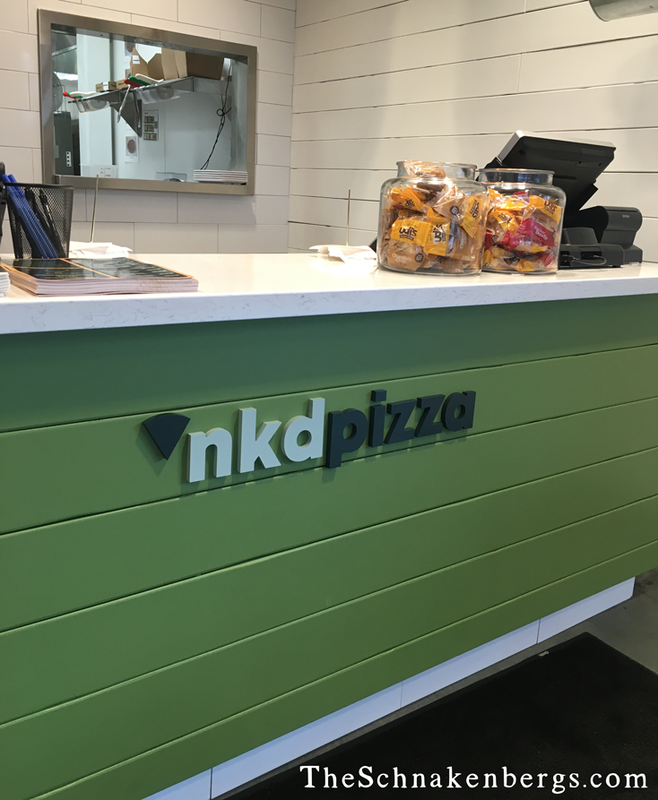 I was lucky enough to be invited to come check out the new NKD Pizza in Sterling Heights last week and see just what they have to offer those with dietary issues. 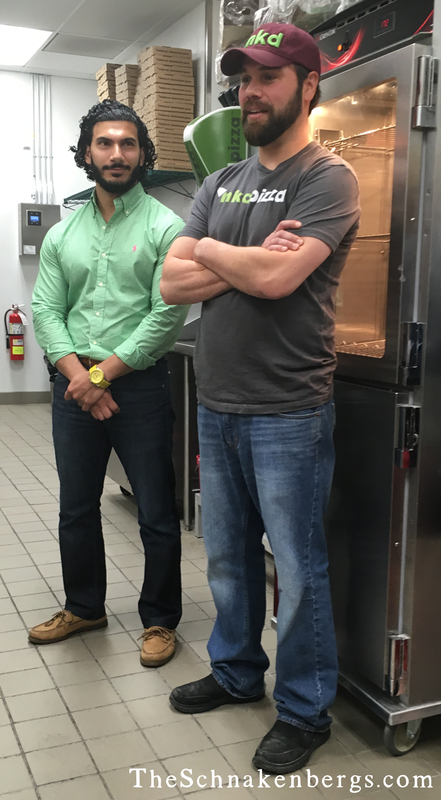 We got a personal tour from the owner, Mo Asker, and had a lengthy chat with the general manager, Corey Keltner (who takes special interest in the plight of the gluten-free diners). 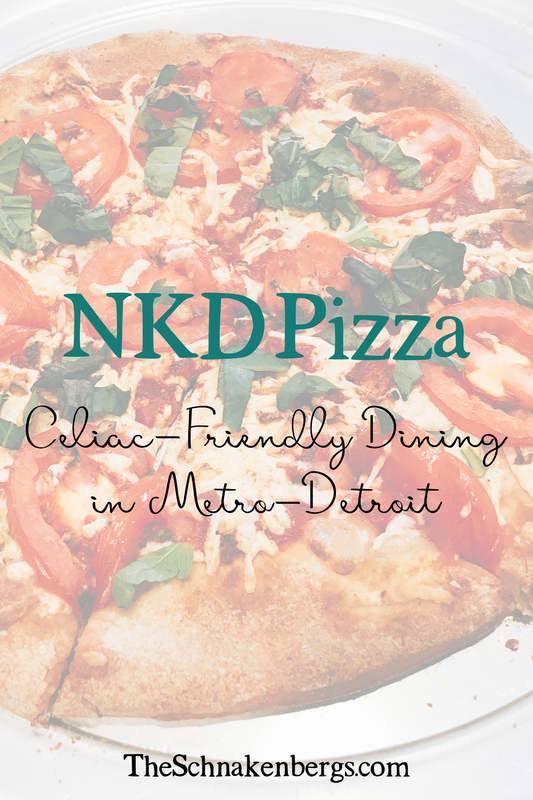 Between the fact that I’m currently studying Nutrition, and I come from a restaurant background, I was totally blown away by what I experienced Friday night at NKD pizza! The entire staff was knowledgeable about gluten (and other dietary restrictions) and were completely trained on how to avoid cross contamination of our food. 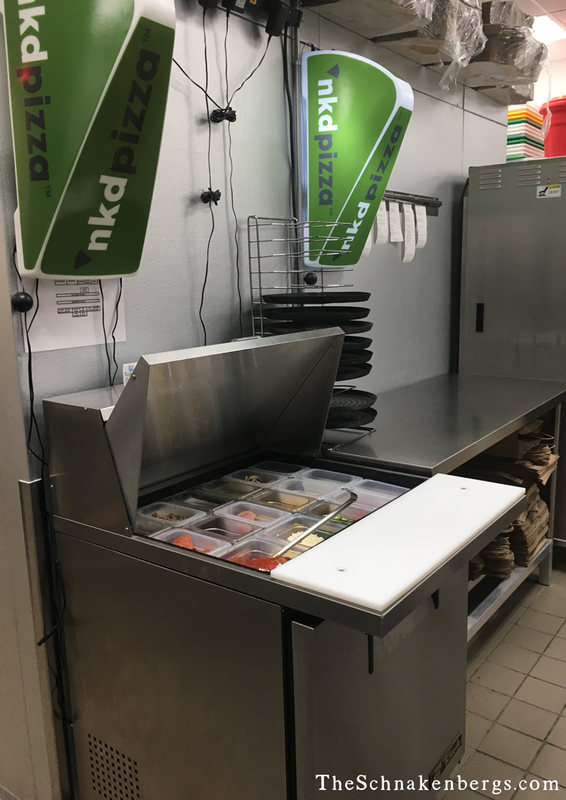 The kitchen has a completely separate prep station for gluten-free pizzas, including dedicated pans and cutting tools stored away from the regular ones. If you’re GF, you know that when it comes to pizza, it’s always the cutting tools that present the biggest risk of cross-contamination. While a lot of the larger chains are starting to offer GF options, they aren’t meticulous about prep stations, changing gloves, or using dedicated cutting tools. You always run a risk when you order GF food anywhere. Bonus: it was probably the best GF crust I’ve had in a very long time. And one of the larger GF pizzas that I’ve seen offered (12″!). This is a huge deal for a large family like mine where we order GF pizza for everyone to minimize my risk of being contaminated. At a normal chain, we’re not only running the risk of cross-contamination, but we’re paying $10-12 for a tiny personal sized pizza…for 8 people! It gets expensive fast and it’s rarely worth it to order pizza. At NKD, we’d maybe need 2-3 pizzas and they’re only $12-13/each. That’s seriously half the price for my family! And safer for me! In our group Friday, we had three people with gluten issues, someone who was dairy-free, and someone with a nut-allergy. Every one of us was treated with care, and thoroughly impressed with how “normal” our pizza felt. 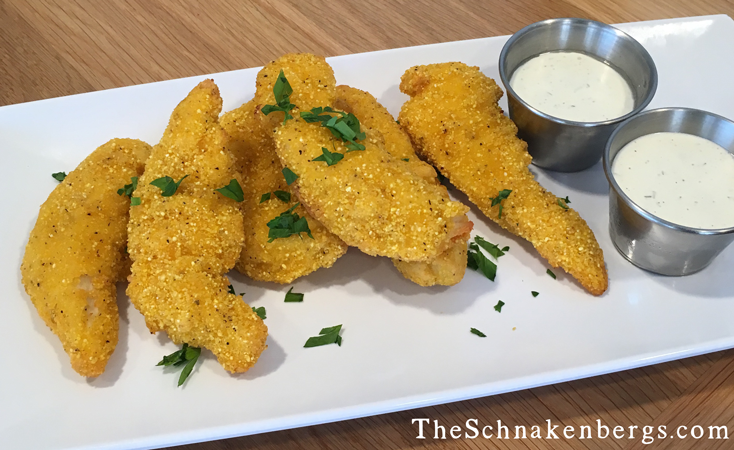 They even served GF chicken strips! Pizza is a universally loved food. When made right, it can be a magical eating experience. Unfortunately, many pizza makers put profit over pizza. And even though most pizzas don’t have corners, these places still manage to find ways to cut them. They substitute subpar ingredients, use food-like products and make generally lousy pizza that tastes terrible and doesn’t do your body any favors when you eat it. We’re fed up with being fed lies. These so-called pizzas aren’t pizzas by any cheesy stretch of the imagination. So we set out to prove it, one handcrafted pizza at a time. We knew deep down in our pizza-loving hearts we could make better pizza. We could make it fresh, serve it fast and not sacrifice quality for speed, convenience, profit or anything else. We could use real, flavorful ingredients. We could keep the bad stuff out, keep the good stuff in and make people fall in love with pizza all over again. And we could do it all openly, honestly and shamelessly. Because we have nothing to hide. We simply make and serve pizza in its purest, naturalest, nakedest form. Which is win for us, for pizza, for all—no matter how you slice it. Seriously, ya’ll, I’m giddy. 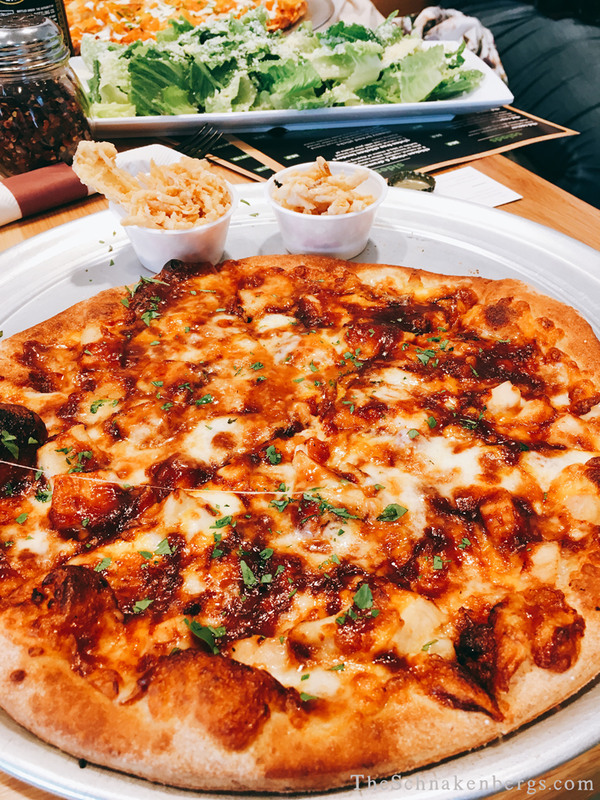 Their regular (non-GF) crust is made from a 10-ancient grains mix that even includes pre- and probiotics and is super glycemic-friendly. That’s way better for you than the normal run of the mill carb-overload crusts. (And they have a “skinny” option, too.) Even the GF-crust boasts the pre- and probiotics! All of their produce is prepped in house, even down to coring and slicing their own pineapple. And as much as possible is sourced locally. Each and every sauce is made in house, too. The pizza sauce, buffalo sauce, bbq sauce, and salad dressings. Each one lovingly made right there so there’s no guessing about the ingredients. Folks, this is both foodie and allergy heaven. All of their meat is antibiotic-free and their cheese is 100% natural. The one in Sterling Heights is already open. Mo has plans to open THIRTY more stores over the next five years. The next one is opening in Shelby Township SOON! I hear Mo bought the franchise rights for Arizona, too. So they’ll be there in the near future! But otherwise, you will only find them in the DC Area and Dubai. Drat, I know. But the foodie and nutritionist in me sees that this sort of thing is catching on and the more in demand it is, the more this will spread. I’m excited to follow and see where it goes!